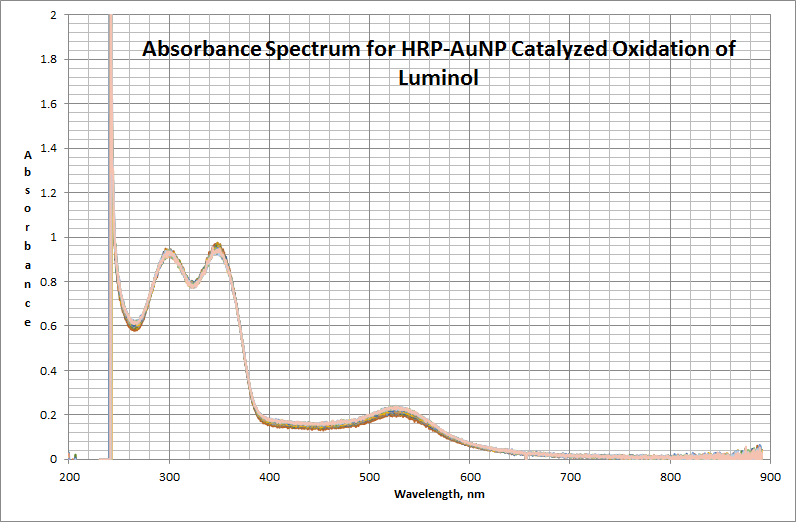 To test the activity of our HRP-NPs for the catalytic conversion of luminol. Add 969.61 μL of the luminol stock and 1.598 mL of the hydrogen peroxide stock to a 10 mL volumetric flask. Dilute the solution to 10 mL with buffer. Add 2 mL of the luminol-H2O2 solution to a cuvette. Just before 1 minute, add 1 mL of 60:1 Au:HRP solution. Add 1.00 mL of 2.33 mM gold solution (HAuCL4) to a 10 mL volumetric flask. Add 1.73 mL BSA (90x more gold than BSA) to the volumetric flask. Dilute the solution up to 10 mL with deionized water. Transfer the solution to a test tube and cap with aluminum foil. Heat in the oven at 80°C for four hours. Transfer the solution to a plastic falcon tube. For 60:1 Au:HRP solution, 2.56 mL HRP stock and 850.34 μL of gold stock were added to a 10 mL volumetric flask. The solution was diluted up to 10 mL with deionized water. The 10 mL solution of gold and HRP was placed into a test tube. The test tube was placed in the oven at 80°C for four hours. 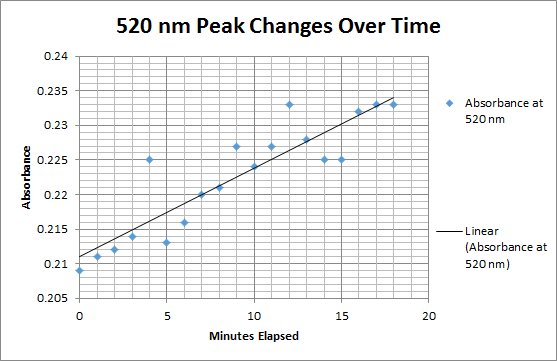 Note: Spectra overlap for a total elapsed time of 19 minutes. The buffer was 5.1 mM Tris at pH 8. The stock concentration of luminol was 1.46 mM. The stock concentration of hydrogen peroxide was 44.29 mM. The stock concentration of gold (HAuCL4)was 2.33 mM. The stock concentration of BSA was 15 μM. The stock solution of gold was 2.94 mM. The stock solution of HRP was 16.27 μM. This page was last edited on 26 September 2017, at 23:29.